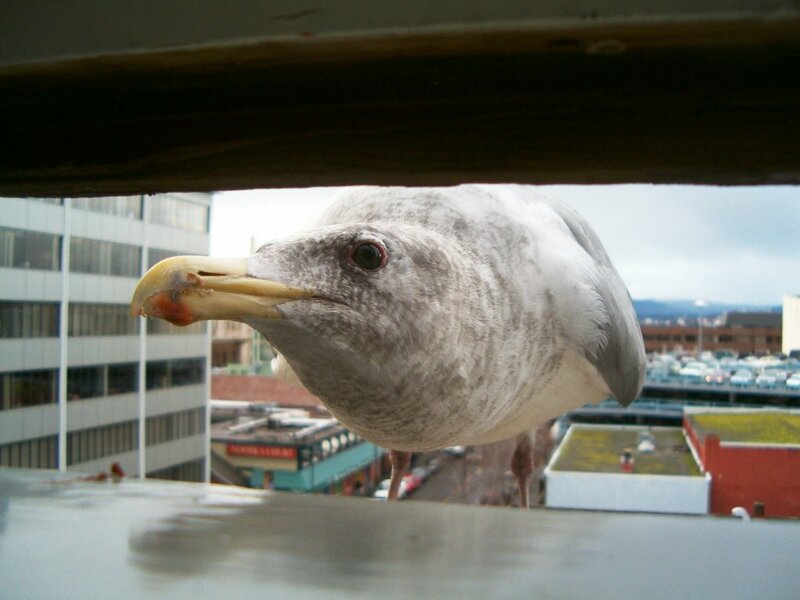 This image, of a gull staring into the window of The Strathcona Hotel in Victoria BC, was taken Jan. 17, 2006, with an HP735 compact (my first digital camera). I won 1st prize in a newspaper photo contest with this. This weekend expedition I will be heading back to Stanley Park, to take part in the Stanley Park Ecology Society‘s “A week in the life of Stanley Park” photo contest. This contest is open to photos taken from April 6 to 14, so either Saturday or Sunday I will head out and try to shoot something. My best bet is to enter images in the Nature category. It will be a tough contest though, as there are a lot of great photographers making great images in Stanley Park. I do not have much experience winning contests, but I did get some honourable mentions at the ESC/ESA JAM last fall (thanks Adrian, for the nice write up!). The plan will be to go out, take some strong images, enter the contest, then report back here. Stay tuned! PhotoLife Canada has a monthly contest, this time featuring insects. But you must enter today! Thanks again Adrian! I sent some images in, including the Bombus!